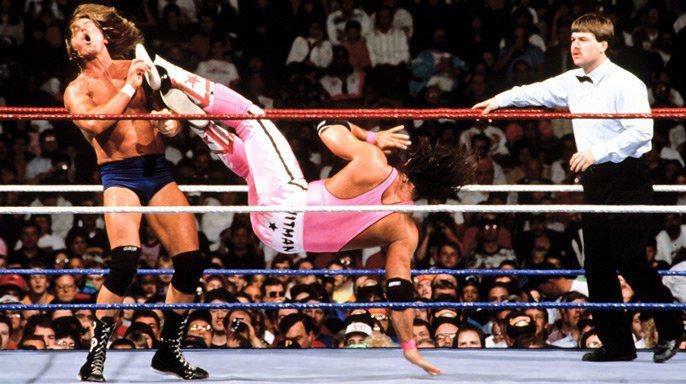 The road to WrestleMania continues today as I look back at what I feel is the 32nd greatest match in WrestleMania history. The countdown started yesterday with match #33 on the countdown, which was The Ultimate Warrior defeating Hulk Hogan at WrestleMania 6. For match #32, we head back to the early 1990s once again. “Rowdy” Roddy Piper was a part time wrestler and announcer for WWE in the early 1990s. He was 37 years old, so he started slowing down as a performer. Piper won the Intercontinental Title from The Mountie at the 1992 Royal Rumble. The Mountie won the title two days earlier from Bret Hart, which means The Mountie was just a transitional champion. I remember Piper winning the IC Title well. I don’t think anybody has celebrated winning a secondary title as much as he did because it took him a decade of being in WWE to finally win one. Piper winning the Intercontinental Title was significant because even though he was a huge star in WWE in the 1980s, that was the first time he won a singles title. Piper apparently refused when they would suggest title victories. Another weird quirk about Piper was that he didn’t lose matches by pinfall. Leading into WrestleMania 8, he had never lost by pinfall on WWE television. Going into the match, Piper was pushed as a babyface champion that didn’t really want to face hart because of how close they were. Hart was also a face, so there was reluctance there. This came during a period where WWE didn’t do high profile face vs. face matches very often, so for them to have a reluctance to wrestle eachother had a different vibe to it. Bret mentioned how important the title was and the integrity of it, so Piper made it clear he would fight him and he would give it his all. I remember watching a segment on television that summed things up well. I found it on Youtube, so I included it below. Piper was one of the best talkers ever. He proved it here. I liked both guys, but I was more of a Hitman fan for sure. Bret was a few years younger than Piper and was better in the ring. I was still about 11 years old, but I knew enough at the time to know who the best guys were in terms of having matches. I was really impressed by Bret from the previous summer when he beat Mr. Perfect (a favorite of mine at the time) at SummerSlam 1991. Plus, being a Canadian like I am, I loved Bret. Piper was a Canadian too, but it’s not like he was portrayed like that on television. If I was a smart fan at the time I would have picked Bret to win for sure. As a kid, I had no idea who was going to win. I just hoped it would be Bret. There are a lot of signs for Bret in the crowd. As I said, they didn’t really show signs in the crowd so I guess you could say this was the WrestleMania debut of fan signs. I remember this match as a kid. I was a huge Bret fan, but I liked Piper a lot too. There weren’t a lot of face vs. face matches in this era. It was an even matchup early with each guy getting an armdrag and Bret did a leverage move to send Piper to the floor. Piper came back with a lot of energy as Bret shoved him back. The intensity picked up. Piper whipped him into the ropes, missed a clothesline and hit a dropkick. When Bret landed, he grabbed his shoulder as if he hurt it. Piper thought he was hurt, so Bret rolled him up in an inside cradle for two. Great spot! Piper slapped him hard. Bret ran at him with a crossbody that sent Piper into the ropes and they took a bump over the top rope to the floor. Piper let him back into the ring while Bret was adjusting his boot. When he did that, Piper punched him in the face. They were both faces, but they each did a heel move there. The idea was they would do anything to win. Piper whipped him into the turnbuckle. Bret came up bleeding. In his book he admitted to doing a blade job although he told Vince McMahon that it was a legit cut. The company had a no blood policy at this point, but I guess Bret felt the need for some color here. Fine by me. Piper hit a bulldog for two. Big knee lift by Piper for two. After a whip into the ropes, Hart hit a sunset flip for two. Piper continued to dominate from there. Bret hit him with a flying forearm as a desperation move. Double clothesline sends both guys down for the double KO spot. I love that spot especially in a match that’s booked in an even manner like this one. Analysis: **** Excellent match. I loved the pace of this match. Slow start, but then it really picked up. That’s something Bret was really great at doing. I loved the intensity. It was also booked in a way where you got the feeling that either guy could win the match. I’m not sure if the blood was necessary, but obviously Bret felt it was. Great job with the finish too. The ref was down, Piper thought about cheating and then changed his mind because he respected Bret so much. He didn’t want to win that way even though the old Piper would have had no problem winning that way. Then Bret won with a very impressive counter hold. Also, you might remember that Bret also used that finish during a classic match against Steve Austin at Survivor Series 1996. This was definitely the best match of Piper’s WrestleMania career and probably the best in his entire WWE career, at least from what I’ve seen. He also didn’t get pinned often, so that was significant. He was very old school in his thinking and, quite frankly, he was a little nuts too. I’ve always liked him. You can read my full recap of WrestleMania 8 right here. Both guys wrote books where they talked about the match a lot more, so check those out for more comments. The match took place 25 years ago and definitely is considered great in any era. They told a great story with Bret getting weakened by the blade job, yet finding a way to come back to win the match with a smart counter to the sleeper hold. The ref bump was an example of why you need to do them once in a while to help tell the story of a match. The old Piper would have cheated when the ref was down because he was such a heel. However, this version of Piper was reluctant to do that because he considered Bret to be like a family member and he didn’t want to beat him that way. As I noted earlier, it was the right move to get the title back on Bret as the younger wrestler. Piper only won it for two months to do the job. As Bret said in that quote above as well as his book, beating Piper was a significant thing for him at that point in his career because Piper was a former WrestleMania main eventer that had a lot of credibility. You need older guys to put over younger guys to make the younger guys look like bigger stars. That’s basic pro wrestling theory that worked perfectly in this instance. Another point worth making is that matches like this really made the Intercontinental Title feel like something special from the late 1980s through the early 1990s. It’s why fans that saw matches like this will always talk about how important the Intercontinental Title was. If you lived through it then you know. If you didn’t, hopefully you can understand. Piper was out of the picture after this loss. His acting career was starting to take off a bit, he was getting older and the injuries were piling up, so he wasn’t a part of the regular roster again. He did have some matches from time to time while also doing commentary and became WWF President in 1996. Other than that, he was in a more reduced role. Hart began his second Intercontinental Title reign and held it for another four months. He dropped it to the British Bulldog at SummerSlam 1992 in one of the greatest matches ever. I would give that match five stars in case you’re wondering. Hart’s two IC Title reigns from August 1991 to August 1992 totaled exactly 300 days, which means he held the title for about 10 out of 12 months during that period. Hart went on to win his first WWE Title less than two months after the SummerSlam 1992. It’s not fair to say that this match against Piper propelled him to that main event level because Hart was heading in that direction anyway. However, the crowd response to this match plus the quality of the work certainly opened up the eyes of management when it came to him. Vince McMahon and WWE’s decision makers had to know at WrestleMania 8 that Hart was a guy they could build around for the next five years. The match was about using the bigger name veteran wrestler that was a former main eventer (Piper) and having him put over the younger guy that was a main eventer of the future (Hart). It’s easy to say Wrestler A will put over Wrestler B and hope it’s a great match. To their credit, they built the story up well enough that the crowd cared a lot about seeing them have the match. The post match hug was the perfect way to end it with both guys leaving together. I’ll be back tomorrow with match #31 on the countdown.